This study investigates critical success factors of wearable technologies’ usage for Pay-as-you-live (PAYL) tariffs as an emerging innovation from health insurance companies. The research model was developed based on a literature study and conducted interviews. It combines the unified theory of acceptance and use of technology 2 (UTAUT 2) models, the privacy calculus theory (PCT) and the mobile users’ information privacy concerns (MUIPC) model. By conducting an online survey with 353 participants, a structural equation modeling (SEM) approach was used to test the research model. Results show that the perceived value is an antecedent of intention to use, which comes from insurants’ risk-benefit analyses. Further, this study shows that currently privacy risk factors dominate individual’s perceived value of wearable technologies’ usage for PAYL tariffs. Diese Studie untersucht kritische Erfolgsfaktoren der Nutzung von Wearable-Technologien für Pay-as-You-Live-Tarife (PAYL), als aufkommende Innovation von Versicherungsunternehmen. 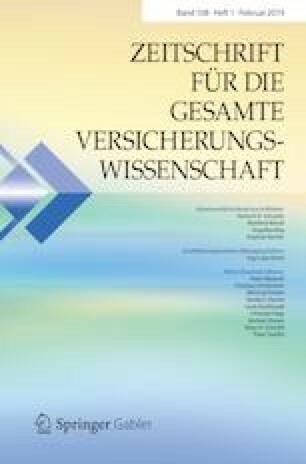 Das Forschungsmodell wurde auf der Grundlage einer Literaturstudie und Experteninterviews entwickelt. Es kombiniert die Unified Theory of Acceptance and Use of Technology 2 (UTAUT 2), die Privacy Calculus Theory (PCT) und das Modell der Mobile Users’ Information Privacy Concerns (MUIPC). Anhand einer Onlinebefragung mit 353 Teilnehmern wurde das Forschungsmodell mittels Strukturgleichungsmodellierung (SEM) evaluiert. Die Ergebnisse zeigen, dass der wahrgenommene Wert eines PAYL-Tarifs, der sich aus einer Risiko-Nutzen-Analyse abgeleitet wird, die Nutzungsabsicht maßgeblich beeinflusst. Darüber hinaus zeigt diese Studie, dass Risikofaktoren des Datenschutzes den wahrgenommenen Wert von Wearable-Technologien für PAYL-Tarife stark dominieren.